But because carriers will ask different questions and emphasize different variables for pricing purposes, the quotes you get on home insurance policies can cover a huge range. That means comparison shopping is the only way to be sure you’re getting the best home insurance quotes. But hitting a series of insurance company websites one by one to compare home insurance quotes can take hours and may not get you accurate results. For one thing, the rates you find may not be based on the same coverage levels, making one policy look more or less expensive than it truly is. That’s where insurance comparison sites can be a huge help in your search for affordable home insurance quotes. These sites let you instantly compare rates from multiple carriers, and the best ones provide accurate and personalized rates, insurance discounts, and coverage options all on one site. In order to provide an accurate list of options, these comparison sites ask you for basic information such as your age, address, home size, and home value. Such details allow the site to provide a realistic list of different rates, options, and carriers so that you can easily compare home insurance quotes. Sadly, however, not all sites that claim to provide home insurance quotes are the real thing…. There are two types of insurance comparison websites: quote comparison sites and lead generation sites. Home quote comparison websites present users with rates based on information submitted during the shopping experience. You can then decide which quote to pursue, and the data you entered is transferred to the agent or company website, greatly expediting the purchasing process. These sites do not sell your information to insurance carriers or agencies. Unlike true quote comparison sites, lead generation sites simply sell your information to their advertising partners—typically insurance companies. These sites are not built to provide you with personalized quotes and are not much help when trying to compare home insurance quotes. Avoid these sites unless you’re eager to receive tons of cold calls from insurance robocallers and desperate agents. Which Variables will Affect Your Home Insurance Rates? Your home: Is bigger always better? Large, expensive, and customized houses demand more insurance coverage. The more that can conceivably go wrong, the more your insurance company will charge. Your area: Each region of the U.S. has its own risk profile, especially concerning the likelihood of natural disasters. Living smack in the middle of Tornado Alley, or in a cliffside coastal home, will present a unique set of risks. Will you need extra earthquake insurance for your home? What about flood insurance? Your stuff: Personal property coverage for all of the belongings in your home is a vital element of the typical homeowners insurance policy. The more you own, the more you’ll need to be covered. Hoarders beware! Your protection: Investing in effective safety and security features for your house (smoke detectors, fire extinguishers, deadbolts) will stave off danger and decrease your home insurance rates. Your past: Already filed a home insurance claim? Expect the insurance industry to react in kind: your rates will most likely increase. The following comparison websites offer real-time, accurate homeowners insurance quotes. Insurify is a free insurance comparison engine that provides real-time, accurate quotes from top insurance companies nationwide. The site offers a wide variety of carriers to choose from and an easy-to-use interface, and can effectively serve consumers in all segments of the market. To date, it has delivered over 4 million insurance quotes from top providers such as The General, MetLife, and Liberty Mutual. Insurify has been featured on Forbes, the Wall Street Journal, and CNET, and is considered one of the top insurance comparison sites. The site asked simple questions about my home’s address, age and value, along with a few questions about me (name, email address and credit score). It then offered me a set of three packages: a basic, standard or premium home insurance policy. The differences between the three included extended replacement coverage (25% vs. 50%), personal liability coverage and medical payments coverage. 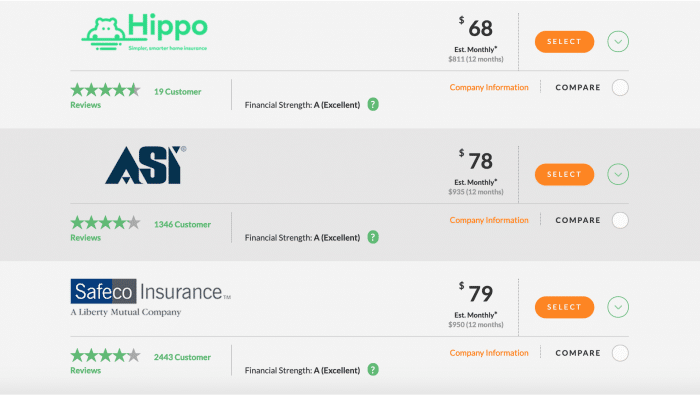 Results: Insurify produced three quotes for the “standard” coverage policy, one for $68 per month, one for $78 per month, and one for $79 per month. Clicking on the button to the right of each quote brought up a pop-up window with options to apply for the homeowners policy online or call an agent from that carrier. It also gave me a chance to create a custom package in case I wasn’t satisfied with the three default options. Each quote included information about the company, such as the year it was founded and the services it offers. My ability to easily compare home insurance quotes allowed me to see how the policies differed: there were a few coverage areas that were a bit different between the two quotes, and seeing them side by side made it easy to pick those out. Underneath the quotes, the site provided a list of links to other insurers, with a “Get Quote” button to visit that site. I could also click back and forth between basic, standard and premium tabs to quickly see the quotes for those coverage levels. Overall, this site provided a clean and easy-to-use interface with lots of information about my coverage and insurer options. Policygenius is another homeowners insurance quote website that generates real-time quotes from multiple insurance providers. In addition to home insurance quotes, Policygenius provides rates for life, health, and disability insurance (among others), as well as blogs with information on these various types of insurance. The site also has an Insurance Checkup tool that asks basic questions and recommends which types of insurance users should have. How it works: Policygenius’ shopping process asked me for my address and contact information. The only thing it wanted to know about my house was whether it was a single-family home. Results: Policygenius took my information and informed me that I’d receive an email from a licensed expert within 24 hours. There was no option to look at actual quotes or even choose policy options. What’s more, the site required me to enter my phone number, giving me the uneasy suspicion that insurance agents would be calling me soon to sell me coverage. These sites often draw visitors in with competitive rates, but then transfer you to a different site to continue shopping and complete your transaction, often at a far less attractive price. This is because lead generation sites are paid to sell your information to an agency, not to present you with the best rates on home insurance. You can sometimes get home insurance quotes on lead generation sites but you should expect them to be far less reliable than quotes from true comparison sites. Using lead generation sites most likely means that you’ll need to go to the various home insurance websites to find real rate information, which arguably defeats the purpose of using a quote-generating site at all. CoverHound is a free, online comparison tool that provides quotes for both business and personal insurance. The site also has a Learning Center with articles on insurance-related subjects. CoverHound says that its advisors are “compensated based on service” rather than by commissions, implying that said advisors are motivated to find the best policy for customers rather than the most lucrative one. How it works: The quoting tool didn’t work until I switched browsers to Microsoft Edge (probably because I have third-party cookies disabled in my primary browser). CoverHound asked me quite a few questions about my home, such as when I’d bought it and whether I had a dog. The site then wanted my contact information. Text above the Get Quotes button informed me that by clicking the link, I was giving CoverHound permission to source data about my credit history and insurance claims history. Results: After a minute or so of processing, the quoting tool spit out eight different home insurance quotes ranging from $101.67 to $177.25 per month. The site preset my coverage limits and deductible and wouldn’t let me change them to produce more accurate quotes. Clicking the Select button next to one of the quotes took me to a page saying that they’d call me shortly to discuss the quote. I appreciated getting actual quotes, but without the ability to adjust coverage details, the numbers were somewhat inapplicable. For example, the site assumed my home’s value was $400,000, which could be inaccurate given it didn’t even ask how large or how old the house was. Insurance.com is a free, online comparison tool that provides quotes for auto, life, health, and home insurance. It has numerous articles related to insurance and provides information on auto insurance by state of residence. There’s a calculator that provides the average home insurance rates for your area based on coverage level. How it works: I entered my zip code and was immediately dropped into a page with a list of several renter’s and home insurance providers. Results: The site provided me with a total of five links, one for renter’s insurance coverage at Lemonade and four for home insurance from various carriers. Each Get Quote link simply sent me to the provider’s website. Apparently, Insurance.com’s home insurance quote tool is strictly an affiliate link funnel to various carriers. InsuranceQuotes is a free, online comparison tool that offers quoting processes for auto, life, health, homeowners, and other types of insurance. The site also has articles on insurance-related subjects and provides information on car insurance by state, including average rates. How it works: During the quoting process, I was asked for some basic information about my home and insurance history, along with my contact information. Clicking the Get Quotes button required me to consent to a declaration that I would be called by up to eight insurance or partner companies, potentially including robocalls. Results: After answering the required questions I ended up on a results page suggesting that I “Click at least 2 to 3 companies below to find the best rate!” with links to five different insurance carrier websites. It also informed me it had matched me with three insurance agents who would be contacting me shortly. How it works: The quoting tool asked for the type of home I owned, its age, and its location. It then wanted my contact information. Boilerplate text above the “Get Your Quotes” button informed me I might be contacted by up to five home insurance companies, agents or robocallers for marketing purposes. Results: The quoting tool sent me to a page saying that it had matched me with the following insurers in my state, and provided a list of three insurance carriers and five insurance comparison sites or agencies. Clicking the Get Quote button next to a listing took me to the website in question’s quoting tool, not an actual quote. QuoteWizard is another insurance lead generation site that sells leads to insurance agents. In addition to home insurance, they also offer quotes for life, renters, health, and auto insurance. The site also has a blog with articles about various types of insurance. How it works: The home insurance quoting tool asked me a series of questions about my home, including its age and number of stories. It also asked for my name, address, email, and phone number. Text beneath the Get My Home Quotes button gave the usual warning about how I was giving express consent for telemarketing by agents and robocallers. Results: QuoteWizard dropped me on a page with links to three different insurance carriers. Clicking the See Your Rate button by each listing simply sent me to the carrier’s own website. Results: After a short wait, the quoting tool produced three home insurance quotes ranging from $13 to $16 per month and two links to other sites with buttons allowing me to “Check Price.” Clicking one of these links redirected me to the start of the home insurance carrier’s own quoting process. Clicking the “View Details” link next to the quotes provided a bit of information about the insurance carrier, but there was no way to select the offer. Instead, it seems visitors need to call the provided number to speak with a licensed insurance agent in order to sign up. The Simple Dollar is a personal finance site with information about credit cards and other debt products, insurance, investing, and banking. There’s a blog with numerous personal finance articles and tons of reviews of various financial products. How it works: The homeowners insurance quoting tool is built into the middle of a page offering advice on how to choose an insurance policy. It asked for just my zip code, then populated the page with a list of carriers. Results: The list included eight insurance carriers and comparison sites. None of the results had actual quotes, just links to “compare quotes” on the various sites. Clicking the link took me straight to the new website. This isn’t so much a quoting tool as a directory of available insurance providers for the visitor’s zip code. Like The Simple Dollar, ValuePenguin is a personal finance site dedicated to helping consumers make informed decisions about their credit cards, banking, investments, and insurance. The site offers quoting tools, in-depth financial product reviews, and analyses of industry trends. How it works: ValuePenguin’s quoting tool asked me for my zip code, then immediately sent me to a page with a long list of home insurance carriers and other quote generation sites. Text at the top of the page announced the listed providers “offer the best premiums based on the information you have provided,” although all I had provided was my zip code. Results: Again like The Simple Dollar, none of the results had actual quotes, just links to “compare rates” on the various sites. Even if you’re happy with your insurance provider, it’s best to compare home insurance quotes every time your policy is up for renewal. If you find a better price elsewhere, you can always take the quote to your current provider and ask if they can match it. You might just end up with the best of both worlds: a home insurance provider you love and a great rate! It’s also wise to consider tweaking your coverage options. For example, if your income has gone up, you might want to raise your coverage limits to protect your savings in case something goes wrong. When you’ve worked out just what coverage you need, a home insurance quotes comparison site can be helpful in finding the best price for your desired policy. However, you’d be advised to stick to reputable comparison sites that give you real quotes rather than lead generation sites that will throw you on the mercy of cold-calling insurance agents. You may find that a few minutes spent comparing quotes on Insurify will save you hundreds of dollars a year in insurance cost.